Many of us do engage in exercise without taking proper care of our skin or having it in mind while we partake in workouts. We place too much concentration on the fitness we tend to achieve during the process of exercising with little or no concern about damages that can be done to the skin. If i should ask a question, how many of us actually care for our skin while exercising? Are we aware that lack of hygiene while working out can lead to clogged pores and bacterial infections? What about the crash diets that makes your skin vulnerable to acne and dryness? Anytime you exercise it is proper you also maintain a glowing skin, because if you do not it will definitely have a negative effect on your skin. Let us look at some 5 useful skin care tips you must follow while you involve in exercise. How water is definitely great for clearing you skin, as it is bound to open the closed pores. But i doubt if you will like to end up having a dry skin. So ensure that you take a shower in the right temperature of hot and cold water, to prevent dryness of the skin. Finally, do not forget to apply some moisturizer after you shower. It is a normal myth that sunscreen should be used only during summer period, but actually the sun does not disappear during winter periods also. Ultra violet rays can still harm your skin. Also, the warm sun and cold air can both leave you with dry and cracked skin. Therefore, never go out exercising without your sun screen. Sweat clogs your pores filling them with bacteria. So after exercising it is proper to wash your face, especially if you are in the pool, at the gym, since the chlorine will dry out your skin. 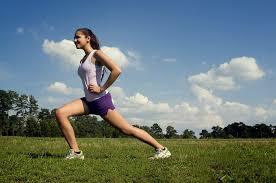 Most of us normally go make use of our phones while we are exercising, to track our exercise or to listen to music. But when we do this, we should always remember that our sweat is eventually going to be passed on the phone, which leaves a lot of bacteria on it that are capable of harming our skin. It is advisable to always clean our phones with disinfectants once we get back home. Well, we all know that is quite important to look pretty always but is a big turn down to do your makeup while you work out. The price you will pay for it is pretty bad. If you do makeup while you exercise, the makeup tends to blend with your sweat, which is definitely not so good for the skin. It will eventually lead to black heads and other types of acne. It is a big NO to do makeup while you exercise.